One of modern electronica’s most mercurial, Aaron David Ross (half of Gatekeeper) a.k.a. 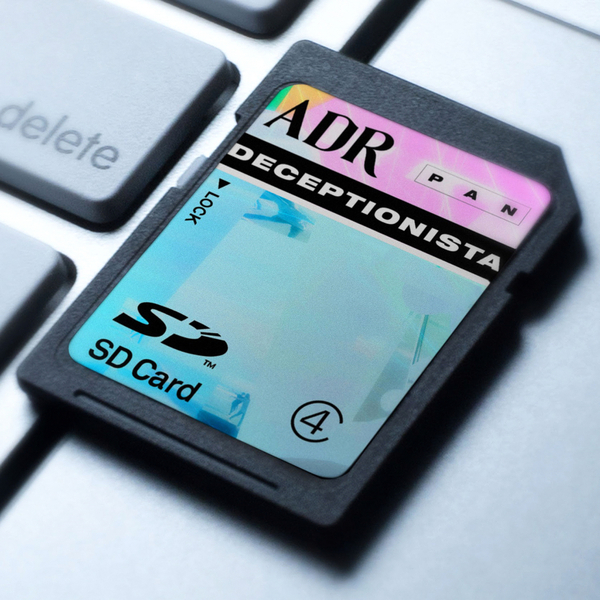 ADR pals up with PAN to present his latest multimedia work, Deceptionista. It sees dual release on SD card and digital download in conjunction with the launch of an “immersive virtual ecosystem” spawned from the PAN website using Harm van den Dorpel’s Deli Near program - a sort of social network to link content from across the web with new artist projects and collaborations thru the label’s new online platform. We’re happy to report that the sonic element is ace. He’s thankfully reined in the ironic acid jazz tendencies of Chunky Monkey for Hippos In Tanks to deal with a more abstract, collaged palette of searing vapourware dynamics, 3D tessellating polyrhythms and constantly morphing spatial settings. As far as we can grasp, the music well reflects the project’s internet-diffused roots, sounding something like a non-linear traverse of a million loading windows or the ecstatic internal thoughts of crammed memory card.